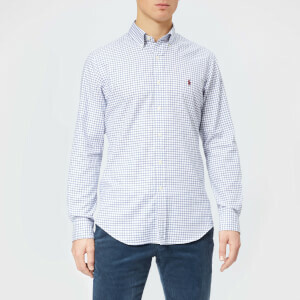 Men's check shirt from Polo Ralph Lauren with a pure cotton construction. Cut in a slim fit, the long sleeve shirt comprises a button-down collar, a tonal button front placket and a the brand's embroidered pony logo on the chest. Features a back yoke and box pleat detail. Complete with split buttoned cuffs and a curved hem. Neck - Measure around the middle of the neck, at the Adam's apple. For a comfortable fit, allow room for your index finger to fit between the tape and your neck. Chest - Wrap the tape around the fullest part of your chest and shoulder blades, then drop your arms to your sides to measure. Sleeve - With your hand on your hip, bend your arm to a 90-degree angle. Measure from the middle of the back of your neck, across your shoulder, and down your arm to your wrist.